One of my friends is a police officer in Fremont, and thus he knows all the awesome hole-in-the-wall spots to grab a bite in his precinct. Mirchi is one of those, and I’ve joined him twice for lunch there now. It’s located at the end of a small strip of shops, so you may pass it by without knowing it’s the treasure you seek. Especially as it’s all the way at the far end of that row. I made a special trip this time just to try their chicken and waffles, which my friend loves and they did not have available the first time I went. Chicken and waffles is a peculiar combination for some diners, and Mirchi adds another element to it, upping the novelty factor. That element is their house blend of Pakistani spices, which makes this a Southern-Pakistani fusion plate that waves a red flag in front of this stomach-charging bull. See, my metaphor isn’t that belabored. The fried chicken coating is red! $9.49 buys you the meal, which includes a freshly cooked Belgian waffle and steaming fried pieces of chicken—a wing, a drumstick, and a giant round ball that I’m going to call a thigh but has way more meat than any thigh I’m used to. 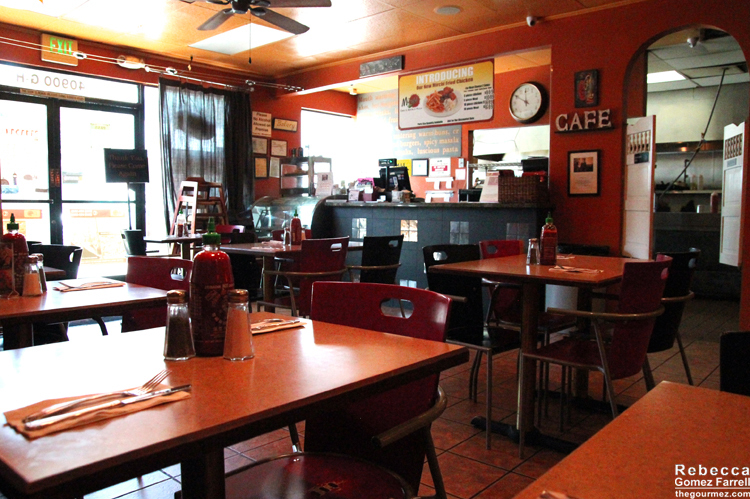 Expect the chicken and waffles to take a bit of time—you want it served fresh off the iron and griddle, right?–and you can call ahead if you’re in a rush. Like I said, my friend’s a police officer, so he’s always in a rush and knows the tricks. The waffle is by-the-books, but that doesn’t mean it’s boring. Rather, it boasts the tantalizing crunch of a well-made Belgian and was cooked evenly throughout, standing up to the moisture of butter and syrup for most of the meal. The chicken is lightly battered and on the greasy side of fried, but that is no complaint. The spice blend satisfied my savory craving, and the levels of salt and pepper were likewise on point. Amped up with the hot sauce served tableside, the coating made for a delicious encasement for the moist meat. What I liked most about the meal was that I finished it all and didn’t feel overstuffed. 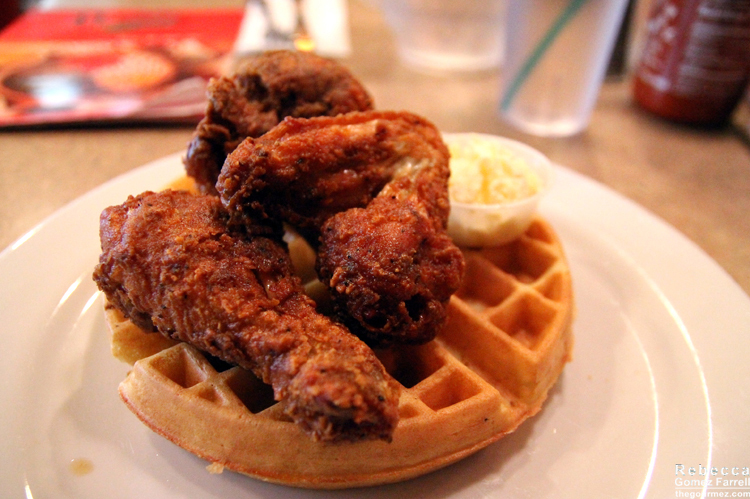 Achieving a satisfying, but not overwhelming, portion size is a feat for chicken and waffles! 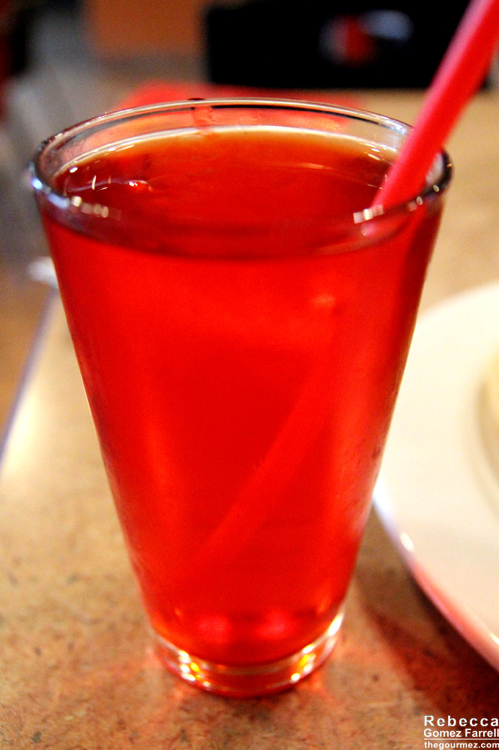 To drink, I chose rooh afza, a rosewater syrup often enjoyed with milk. I just had it with water—bad choice. It ended up way too sweet. Regardless, it added another complementary element to the fusion feel of my meal. On my prior trip to Mirchi, I had their Lahore burger, a beef patty mixed with onions, chiles, and masala sauce and served up with fries that come sprinkled with that same house blend of spices that stars in the fried chicken batter. Trust me, the fries are worth ordering on their own, as the spices make sure you can’t stop at just one. Though I’m not sure that’s actually a good thing. Mirchi also offers their own twists on chicken sandwiches, pizzas, and more standard Pakistani stir-fry dishes. Working my way through their menu would likely prove worthwhile, but I’m not sure I’ll be able to move on from the chicken and waffles. It’s a scrumptious roadblock. Thanks for the tip, Pablo Richardo! Nom nom nom….the chicken and apple salad is great too! I expect a report back!